For the Tsuda family of embellishers, see Sale 4, lot 138. 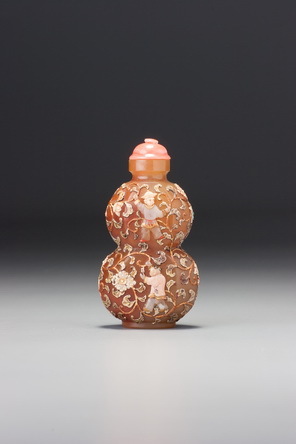 The original Chinese bottle here has all the features of a palace product of the Qianlong period, although there is no mark to exclude a slightly earlier or later date. The material, the double gourd shape, the faceting, and the flat outer neck rim are all typical, although the continuous flare to the inside of the neck is not. That probably represents a Japanese repair to a chipped mouth. The polish on the inside of the neck is different from that of the bottle and clearly reflects a later adjustment. 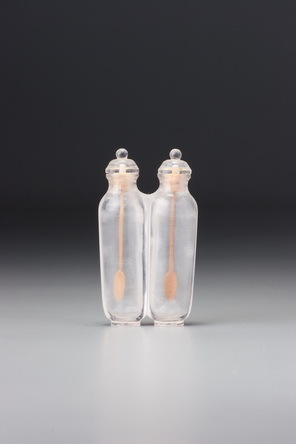 As noted under Sale 3, lot 102, the original bottles most useful and profitable to the embellisher were those that had been damaged and were available at low cost.